Join our new group page on Facebook. Please check out the Nelms Family on Facebook. Feel free to share your news, pictures or videos. August 2012 - Our deepest sympathy to the family of Corliss Newsome on the recent passing of her husband Donald Nance. Please keep Corliss and her family in your prayers. May 2012 - Congratulations to all of our Graduates on their achievements. A few names were passed along: NaK'ia Stringer, Sam Abbott, Anthony Stringer Jr., Leonard Dion Richburg, and Tara Moon. There are many more whose names I have missed, so please send in their names to connie.ross@nelmsfamilyreunion.com and I will be sure to add them to the list. March 2012 - Congratulations to Chris Compton Jr. and his wife Crishell on the birth of their daughter Cydney Giselle born February 28th. 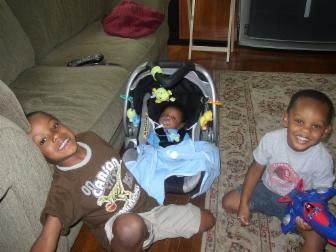 Cydney has an older brother Caleb who will make sure that his baby sister is well protected. We should note that Cydney is the first girl in the Compton family. March 2012 - Congratulations to Tara Moon who received her official Long White Coat & the title of Doctor of Pediatrics during ceremonies held at Howard University on March 16th. Tara is the daughter of Sharron & Roey Moon. Dr. Moon will be moving to Augusta, GA in July to begin her Pediatric Residency at the Georgia Health Science Hospital. March 2012 - Our condolences to the family of Annie Newsome on her passing on March 2nd in Cleveland, OH. Ann is the mother of Corliss Newsome-Nance and Kenneth Newsome. Services were held on Friday March 9th at Liberty Hill Baptist Church. For a copy of the obiturary, please click here. 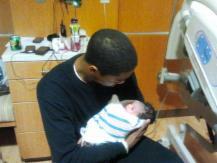 February 2012 - Congratulations to Roderick Jamar Pitts on the birth of his daughter, Naveah on February 23rd. Naveah is the granddaughter of Roderick Pitts. October 2011 - Our condolescences to the family of Sister Betty Williams. Services were held Friday, October 14th at the Fourth Street Missionary Baptist Church in Columbus, GA.
April 2011 - Our condolescences to the family of Annie Ester Sapp on her passing April 4th, 2011. Services were held on April 9th at Fourth Street Missionary Baptist Church in Columbus, GA. For a copy of the Obituary please click here. 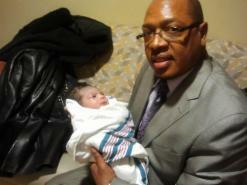 January 2011 - Congratulations to Johnie Mae Miller on the birth of her great-granddaughter A'Niyla Nabors. December 2010 - A celebration of Life, Love and Thanksgiving. Our deepest sympathy to Louise Stringer Mott and family on the passing of William Lee Mott on December 26th. Services were held on December 29 in Phenix City, Alabama. June 2010 - Sadly we announce the passing of Veola Nelms (4/6/1922-6/5/2010) on Saturday June 5th. The Viewing was held on Friday June 11th and the Funeral was held at the 4th Street Baptist Church on Saturday June 12th. For a copy of the Obiturary please click here. September 25, 2010 - The wedding of Byron Key & Kimberly Crawford will take place in Cincinnat, Ohio. Byron is the son of Thermon Key. October 3, 2010 - The wedding of Latrice Pitts, daughter of Roderick Pitts will take place in Detroit, Michigam. Roderick Pitts (Dink) obtained his Masters degree June 21st in Small Business Operations from Devry University/Keller School of Management. Also congratulations are in order for Latrice Pitts, Dink's daughter who got engage the same night. The wedding will be October 3, 2010. Bridget (Milton) Johnson on her marriage in December to Randall Johnson. They are now expecting a bundle of joy in February of 2010. This will be the first grandchild for Eric and Barbara Milton and the first great-grandchild for Rebecca Nelms. Ryan Compton, the youngest son of Carol and Chris Compton, graduated from Oak Brook Baptist High School in Houston, TX. Ryan is currently taking college courses at Lone Star College. He will transfer from Lone Star to Prairie View A&M University in January where he will be majoring in Kinesiology. Chris & Crishell Compton welcomed the birth of their son Caleb Edward Compton on July 15th. Connie & Mister Ross welcomed the birth of their son Colin Mister Ross on July 8th. Chris & Crishell Compton, the son of Carol and Chris Compton Sr. of Houston, TX. who are expecting their first child in July. This will be the first grandchild for Carol and Chris and the first Great-Grandchild of A.C. and Ora Key. Please keep Chris & Chrishell in your prayers. Tara Moon, daugther of Sharron & Roey Moon of Cincinnati, OH started Medical School at Howard University. Tara is the granddaughter of Helen Rankin Merritt. Diane Stringer the daughter of Annie Ester Sapp passed away October 5, 2008. We should keep Ester in our prayers. This is quite a burden to bear along with losing her husband a few months ago. If you would like to contact her the address is : 451 Harold Street, Columbus Ga. 31903. Tommie Lee Nelams, Jr. the son of the late Uncle Tommie passed away in September. At this point we have no contact information to pass along. Mr. & Mrs. (Crishell) Chris E. Compton Jr. on their marriage September 20th in Houston, TX. The groom is the eldest son of Chris and Carol Compton and the eldest grandson of Ora & AC Key. Please keep the happy couple in your prayers as they begin a new life together.